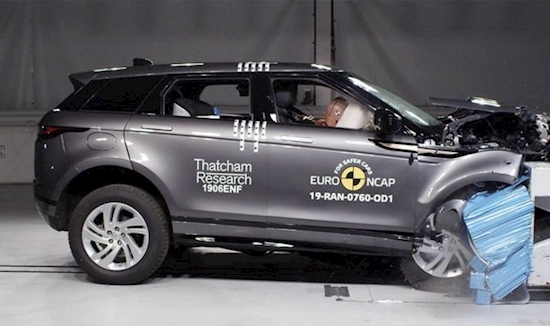 The all-new Range Rover Evoque 2019 has scored a five-star Euro NCAP safety rating, it has been revealed. It also managed to secure a rating of 94 per cent for adult occupant safety – the highest score of any Jaguar or Land Rover product to date. The vehicle was also rewarded with a score of 87 per cent for child occupant safety. Evoque 2019 follows the latest Velar and Land Rover Discovery SUV which were handed five-star ratings. Standard safety systems on the Evoque includes Emergency Braking, Lane Keep Assist, Front and Rear Parking Aids, and a Rear Camera, which contributed to its rating. A whole host of other safety fetaures can be added as optional extras for motorists under two optional packs which are the Park Pack and Drive Pack. Finbar McFall, Global Product Marketing Director at Jaguar Land Rover, said: “The Range Rover Evoque is at home in the city and the country, so we added the latest technologies aimed at preventing accidents and a new vehicle architecture to protect occupants in the event of an incident. Another vehicle that was recently tested by the Euro NCAP team was the Citroen C5 Aircross. The 5 Aircross landed a rating of four stars, which increased to five stars with the optional Safety+ Pack which adds a radar sensor to the camera to enhance the performance for AEB City, AEB Inter-Urban, AEB Pedestrian and adds cyclist detection. “These results show that car manufacturers are still keen and able to achieve the highest safety ratings. "It is especially encouraging to see the continued widespread deployment and improvement of advanced technologies such as AEB and lane support.